Last November we lost one of the greats: Bernardo Bertolucci. Arguably his most perfect film, this adaptation of Alberto Moravia’s novel is one of the most visually dazzling movies ever made (DP Vittorio Storaro went on to shoot Apocalypse Now and most of Bertolucci’s subsequent epics). 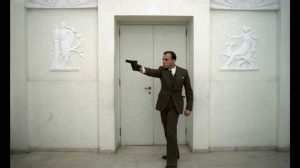 Jean Louis Trintignant is the existential anti-hero, pressed into a political assassination by Mussolini’s security apparatus.